Bring your creativity and unique style to life with gorgeous 3D furniture and home decor items. 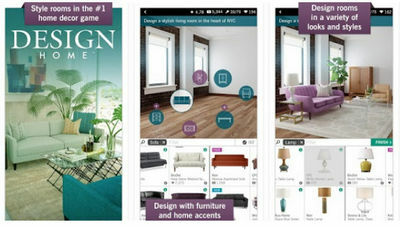 Design Home gives you all the tools you need to make what you imagine. It includes furniture and decors from real, high-end brands like Serena & Lily, Kathy Kuo Home, etc. Our Design Home mods will give you unlimited money to buy stuff ingame and make your houses the best they can be without any financial restrictions! Grab the apk below now and let your creativity run wild! Note: If you are getting “Application Not Installed” error then you will have to install official version of this game from the play store first then try to install MOD APK. I'm having problems though... I have an existing account prior to the mod. Upon mod installation (using the same account) when I try to buy an item it's still deducted from my cash. same problem here can someone help??? This is an OUTDATED version!!! EVERY TIME I open the app, it tells me to update to the latest version and WILL NOT let me continue!!! please post an UPDATED version!!! it is WAY PAST Monday. still NOTHING and NO updated version!!! lie much??? Cut him some slack. It's not like you're paying him for this.